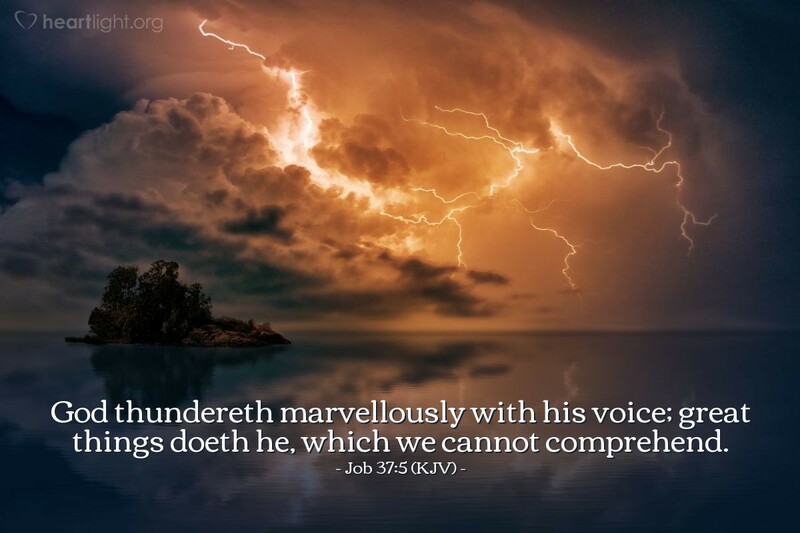 God thundereth marvellously with his voice; great things doeth he, which we cannot comprehend. How does God help us know his will? Clearly God has given us the Scriptures and the Holy Spirit to help us understand the Scriptures. What about more subtle and less defined ways? Most of us have had a "cluster of divine coincidences" (several events in close proximity to prayer): a friend calls/writes at just the right time; we read an article or hear a sermon that has a comment or two directed at just the area of our concern or confusion; several songs in worship convict us in the area on which we are seeking the Lord's guidance; or we simply feel a pull on our conscience that helps us discern right from wrong in a difficult situation. God really means it when he says that if we will pray for wisdom without doubting he'll give it to us, and that if we are truly seeking him we will find him. His voice does thunder in marvelous ways! Holy God, please help me discern your will about several important matters in my life. I don't want to make my decisions based on my limited human wisdom. Please lead me by your Spirit in the direction you want me to go and use me to bring you glory and praise. Thank you for caring about my life enough to show me your way more clearly. In Jesus' name I pray. Amen.